(This article was first published on my blog in October 2007). When the BCSE launched in the second half of 2006, it was basically an anonymous organisation. It had a fine-sounding name, but was not giving out any details on who was behind it, or what their credentials were. I began pointing out this anonymity and identifying its actual leaders in this article: Who are the BCSE? . The BCSE began putting up information on its website about its leaders' identities - but puffed with a large amount of spin and downright falsehoods, which I set about documenting. In response... the BCSE basically reverted to anonymous mode again. Here's the article. When the "British Centre for Slandering Evangelicals Science Education" launched last year, there was one thing that any interested individual would notice pretty quickly. They were almost entirely anonymous. This didn't prevent some more gullible MPs and newspapers from printing their letters, or taking them at face value in some other way - but it's something that I pointed out as a huge question mark over their credibility pretty quickly. So, observation number one is that whilst the BCSE are very keen to give you their opinion on a number of other people (including individuals with apparently more qualifications than the entire BCSE membership combined, they're very reluctant to tell you anything about themselves. I look forward to them beginning to read my website, and addressing these criticisms; however, from my research so far I am confident that the more details about themselves they expose, the lower their plausibility as a group of "Science Educators" will sink. After that, I started naming and describing the true identities and their (lack of) credentials to be masquerading as experts on either science or education. The BCSE responded to this pressure by beginning to publish a little information about themselves. In general, this information only confirmed the accuracy of my research, as even with the best spin that the BCSE could put on it, its descriptions of its committee only confirmed their lack of standing. Some of this "spin", though, we later provided documented proof as being little different to outright fabrication (e.g. see here). One year on, though, the situation is again that the BCSE have become basically anonymous. A large part of this is certainly due to "BCSE Revealed"; it became a regular occurrence that after I posted a new article, the BCSE would scramble to edit its website to cover up whatever embarrassing revelation had just been made. (e.g. See here). A large part of it is certainly because the internal rumbles that "BCSE Revealed" has caused and other factors have meant that over the course of that year, four of the original seven committee named have resigned (one returned); and the BCSE are rather nervous about us knowing just how bad their internal squabbles have been - so apparently, they decided it was just simpler to delete the list of committee members so that we couldn't know. (See here for more of that). So basically, one year on, we find that the BCSE have become anonymous again. That's very bad for their attempts to appear credible. If you receive a communication from an organisation you've never heard of, and then seek to find more by checking out their website, and find that their website tells you basically nothing about their identities - what would you conclude? Why ever would a bona fide organisation need to take such measure to not let you know who they were? The section "What is the BCSE", on its front page, contains lots of spin, but no actual names or their credentials. Go to the "Contacts" page (here) and there are no names, no postal address, no information on any credentials... just an e-mail address, [email protected] They offer to help the media with any help they need... but no information on just why the BCSE might have any credibility that the media should rely on. In terms of identifying any serving officers of the BCSE, there's just what you can find on the front page: ''"... phone our press officer, Roger Stanyard, on 07724938890."' As we've seen before, this description is itself bogus; Stanyard basically is the BCSE, or at least half of it in terms of foundation, direction setting, putting in the hours of work, and so on. 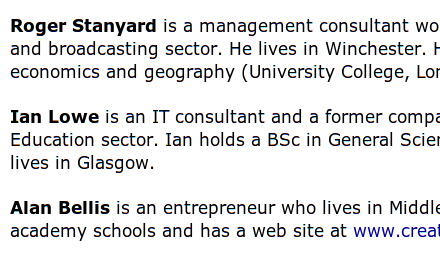 But notice, no mention again of what Stanyard's credentials might be to talk about this or any other subject. Dotted throughout the website, you can find a few individuals named in the odd place, described with the adjective "BCSE Member": but many of these are out of date, as the individuals in question have resigned once they'd perceived that the BCSE was spouting bigoted nonsense, was doomed, or they fell out, etcetera. Looks a bit odd, doesn't it? They want you to believe them - but they're unwilling to tell you anything at all about themselves. Why would that be? "BCSE Revealed" readers will know: because the facts about themselves are damning. As I write this today, though, I do find that Roger Stanyard recognises that this is an unsatisfactory situation to be in, because I find him complaining that some other organisation hasn't published a list of its committee members. "How convenient that the Causeway Creation Committee just doesn't happen to name who are its members and doesn't have a web site. I suspect that if they did disclose who is involved we would have a field day in pulling it apart." (Update late 2007: Not long after this article appeared on my blog, the BCSE published a list of names of its committee on their website, but without providing any details of any of their experience or credentials in the field of science education. I have a page with details on the BCSE's committee members past and present, here).